Peppermint bark meets Thin Mints in this festive cookie recipe. Delightfully minty, the crushed candy canes sprinkled on top add just enough shimmer and holiday cheer — a total crowd pleaser!! If you’re looking for more candy cane inspiration, check out this roundup of 25 creative recipes by yours truly on Brit + Co. — a few easy subs can turn most of the creations into gluten-free-friendly treats! 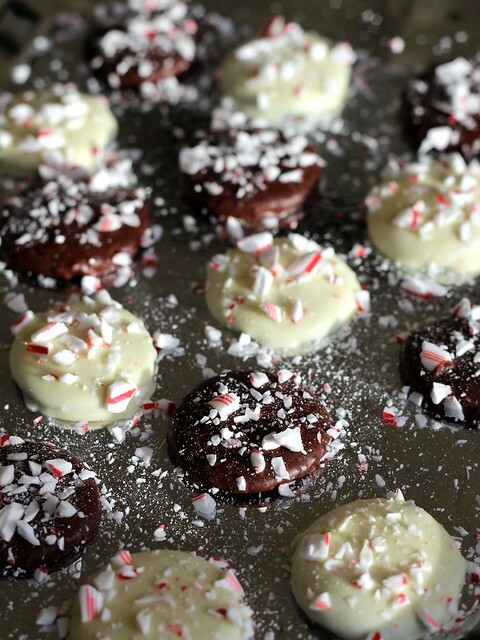 I like to leave a thicker coat of chocolate on these than the original Thin Mints, for a truer peppermint bark effect. Combine melted and cooled butter, vanilla extract and peppermint oil in whatever vessel you used to melt the butter (saucepan, measuring cup); set aside. Sift millet flour through black cocoa powder into a medium mixing bowl, whisk to combine. Whisk in Kosher salt. Pour melted butter mixture into dry ingredients and stir by hand until the dough comes together into a smooth ball. Turn dough out onto a sheet of plastic wrap, pat into about a 3/4″ thick disk, wrap tightly and refrigerate for about 30 minutes (dough won’t be rock hard, just firmed slightly). Line a small, rimmed sheet pan or freezer-safe platter with a silicone baking mat or a piece of plastic wrap (make sure it’s smooth, no wrinkles); set aside. Sprinkle rolling surface with millet flour, turn chilled dough out and knead it a few times to warm dough slightly. Use more flour on the rolling surface and sprinkled on top of the dough as needed. Working with half of the dough at a time, roll out until 1/8″ thick (see notes in the next paragraph for rolling tips). There’s no need to do the whole, one roll, turn dough 45°, roll, turn, roll, turn, on and on as with pie dough. It’s really better if you don’t try to do that past the first couple rolls — the dough is a bit too delicate and crumbly and just tends to tear. Let it stick to the rolling surface, just be aware of it sticking to the rolling pin and sprinkle more flour on top as needed. And if it’s giving you too much trouble, just scrape it up, knead again until it’s a ball and try again — probably with a little more flour on the counter and top of the dough this time. You cannot ruin this dough. Use a small, round cookie cutter (about 1 1/2″) to cut out cookies. Transfer to the prepared sheet pan using a small or large offset spatula (you really need a very thin tool to get under the cookies). No need to leave any space in between cookies — we’re not baking them yet. Repeat rolling/cutting/arranging with other half of dough, knead together scraps and re-roll/cut until it’s all shaped. If you run out of space on your baking sheet, line another (or a plate) with plastic wrap — do not stack cookies! Transfer baking sheet(s) to the freezer and chill for 1 hour. While cookies chill, arrange oven rack in the center and preheat oven to 350°F. Line two large, rimmed baking sheets with silicone baking mats or parchment paper; set aside. Once cookies have chilled for an hour, arrange about half on one of the prepared sheet pans — they hardly spread, so about 1/2″ of space between each is enough. Return other half of cookies to the freezer. Bake until edges are firm but middle is still a little soft, about 10 – 12 minutes (I baked mine for 12). Remove from oven and allow cookies to cool on the baking sheet for about 2 minutes before removing to a cooling rack. Line a large, rimmed sheet pan with a sheet of wax paper; set aside. Mix together crushed candy canes and powdered sugar; set aside. Ok, what we’re really doing here is tempering the chocolate, but it’s really not scary — I take a very relaxed approach (read: no thermometers), and melt the chocolate in batches. The worst that can happen is that once cooled the chocolate looks marbled; while probably not desirable, it is a pretty cool-looking effect. If you want to do things by the book, please refer to the instructions here or here or consult with the chocolate manufacturer for their recommended method. In a small, heatproof bowl (preferably metal, I use a 2-quart stainless steel one by Endurance/RSVP) or the top of a double boiler, combine 6 ounces of the chocolate with 6 drops/dashes peppermint oil. In a small saucepan (I use this 2-quart pan) over medium heat, warm about 1” of water (make sure there’s at least 1/2” of space between the water and bottom of the bowl when it’s placed over the top) until it just barely reaches a simmer. Reduce heat to low and set bowl with chocolate over top. Stir/fold chocolate and heat just until about 75% of the chocolate is melted. Remove bowl from heat and slowly stir until smooth. Place one cooled wafer into the chocolate. Using a fork, drizzle chocolate over top to cover completely. Scoop cookie out of chocolate with the tines of the fork (don’t let it sneak up to the curved part of the fork, that can cause it to break); holding cookie over bowl of chocolate, tap fork handle on the side of the bowl a few times to remove excess chocolate, letting it drip through the tines (this also pops most air bubbles and ensures a thin, smooth coat). Scrape bottom of fork against the edge of the bowl and slide cookie off fork, onto the prepared pan. Sprinkle with large pieces of crushed candy canes (the small shards tend to dissolve in the chocolate, leading to an undesirable speckled appearance). Repeat with the remaining cookies, melting other half of the chocolate when needed (no need to wash out the bowl between chocolate batches, unless, of course you are switching from dark to white chocolate or vice versa). Allow chocolate coating to set completely at room temperature before packaging or serving — feel free to sprinkle with smaller candy cane pieces once they’re arranged on the serving platter. Cookies keep at room temperature for up to a week (unlike the classic Thin Mints, freezing isn’t recommended due to the candy cane topping). ¹ I use Droste cocoa powder. It can be a bit difficult to track down, but is available on Amazon or at upscale grocers (Drager’s Markets in the Bay Area and occasionally Whole Foods). The most important thing is that you use a Dutch-process (alkalized) cocoa powder for this recipe, not a natural cocoa powder such as this one by Hershey’s. I haven’t tried the Dutched cocoa powder sold through Savory Spice Shop, but it may be worth a go if you’re already at the store or need to order the black cocoa though them. ² Chocolate chips do not set properly!